here is a portrait of Emily that i knocked off for Julia Kay's Portrait Party (my semester break fun) over the last couple of days. The original photo supplied to JKPP by Emily can be seen here. I painted onto white polyproylene panel knowing the brilliant white reflective surface would contribute a luminous quality to Emily's skin. The painting came out nothing much like an Alex Kanevsky (see my earlier post on his technique here). Seems my mark-making is just more restless and variegated than his calm and methodical layering. Emily has amazing eyes and skin, and i wanted to feature them by juxtaposing a finely worked face in a sea of painterly marks. 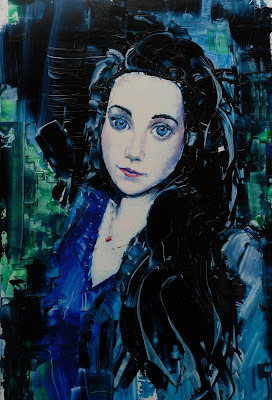 Placing idealized features directly beside abstract expressionist fields of impasto alla prima color, where the clothing, hair and background are none realistic, has the effect of bringing out the porcelain doll quality in her photos. Can one legitimately mix styles in a painting? Using this surface must take a lot of experimenting just to find out what's going to happen with the paint when it gets put down. Do more - keep it all loose - Those tools you mention will help you keep things from looking too contrived. Do more! I like your bold approach... You did get the porcelain like face and the bold surroundings... I'd say success! A doll face for sure! Lovely work! Those blues are wonderful, Harry. There's something magik in this picture, in the straight sense. She could be a lady from a fairy tale. I realise that the real Emily could be Titania herself. On the other hand, I'm intrigued by this polypropylene material. We can learn a lot from you, because you are always experimenting. Thanks, Harry. His face is whitish and pale.The dark blue paint in her hair gives the impression of volume and movement. It is a very good job!!! hi Carrie. Yes, youre quite right, i'm on a steep learning curve with polypropylene. But it's an exciting support to work with. Photos don't do justice to the luminous color where it's kept thin. Thanks for the encouragement. Thanks for the vote of confidence, Marian. I was just so curious to discover if a painting can be both bold and delicate at the same time. cheers, Brian. Always great to hear from you. Have a great week too, friend. Ah Manel, you have such an insightful eye. Yes, i wanted to capture an etherial quality, something not quite from everyday reality, something fragile yet powerful from a dark and emerald other world. I am glad you too could spot that nacient quality in Emily's original photo. Thanks Manel. Yes, Emily's eyes are incredibly blue, especially in this other photo which i also had in mind as i worked, http://www.flickr.com/photos/emilyomarra/4132404974/in/set-72157622746586207/. Thanks for the comments, Paulo. Harry this work is very good and completely different from your previous works. The sweetness of the model, with those huge, beautiful eyes, pale skin tones contrasted with bright dark hair and fondo. All that make this an exquisite painting. Striking work, Harry. I like the otherworldly framing of such a lovely face, which Emily's large blue eyes and pale skin must have suggested. Something extraordinary about the mouth - small and delicate in contrast to her other features yet that to which my gaze is drawn. At first I thought the possibility of an impish smile but no not that at all. It seems to convey an honest kind of uncertainty or a vulnerability not discernible or else obscured in the photo. You have painted such an amazing series of divas and nudes yourself in recents weeks, Lozzano, that i am very encouraged by your comments. And yes, this is the first time i have painted in this way. I probably won't do second one, though i did build some useful skills to take me forward. Saludos amigo. you always bring such sensitivity to your keen observations, Regina. Your reading of the mouth gives me real delight. As i was painting the mouth i was thinking of Leonardo, not just the Mona Lisa's smile (i also didn't want to paint an overt smile though quite deliberately put a tiny upturn at the very ends, esp on the right side), but also what they say about Leonardo putting himself into that painting, and about my key research questions: "Ogni pittore dipinge se" (*smile*). No, the mouth is not the same as the one in Emily's photo (hers is quite wider and the left side turned slightly down rather than up). I found the polypropylene enables me to wipe paint off completely clean, back to sparkling white and so i could attampt the mouth as often as i wanted. I also found that working tiny amounts of paint dry brush gave me fine control over the emerging image (the face, not the surrounds). But my painting is not primarily intended to be a likeness even though it is a contribution to the Portrait Party. JKPP is an excuse to paint, not a constraint in painting. First and foremost it is intended to be an interesting painting. And so i used the photo for the initial composition and to generate ideas. But once the shape of the face was there, and the eyes (though i made these 5% larger than Emily's) and the beginnings of the mouth, i put the photo away and just worked on the painting as an image in its own right, without needing justification from any other image. I always work this way. It springs from a strong conviction that a portrait is a painting, not a replica person. A painting is a painting is a painting. It may start out from a person. It may evoke a memory of a person. But it is an artefact in its own right and asserts an autonomous space for itself in the order of things. It doesn't need to be defended by pointing to some other image. It doesn't need to be excused for what it is, nor apologize for what it isn't. I only needs to be engaged with. Thank you for engaging with this painting. Bellisimo retrato, intrigante, màgico, una mirada que atrapa, azules y verdes jugando de fondo, y poniendo èse toco misterioso. Harry, you knew how to get all the beauty of this deep glance. Magnificent. Gracias Azucena por venir a echar un vistazo. Me alegro de los aspectos no realistas eran a su gusto. Saluda. Merci, Olivia. Je viens de regarder pour la Botticelli à Emily. Harry, Couldn't find an e-mail, so this will have to do. Thank you for taking the time to examine my work so considerately and for leaving your thoughts in such a comprehensive comment. Always a pleasure to connect with someone who rises above a simple emotional response to a piece. Have to admit I hadn't heard of tachisme until I came across your blog. (I'm no art historian.) I find your method and style of combining abstraction and realism so appealing. A sort of simultaneous contrast with lots of energy and interest. And your brushwork, drawing, and creativity are inspired. Jealous. I look forward to following you, Harry, and watching your work evolve. I have the feeling my own art will be influenced by what I see. Best. Candace. You really captured her youth and beauty, which I always find to be most difficult. The colors work great, I love the darkness with the blue, it’s really juicy and sumptuous. I thought I would toss in my two cents in regards to mixing painting styles only because this very topic came up in a critique session of a class I took. But please bear with me- I am not as eloquent as you. I think the general consensus we came to at the end of our discussion in that class is that mixing styles can work, but it is not easy to achieve. Somehow the styles have to be integrated so their reason for being makes sense in the context of the subject matter. Or if you are going to mix styles for simply for interest's sake then the styles need to work well enough together so that the flow of the painting is not interrupted. In my modest and very inexperienced opinion, this portrait of Emily does work. I feel that by painting her hair and the background in such an abstract, expressionistic and very painterly way, you have created somewhat of a frame for her delicate, soft and more controlled features. It is an interesting juxtaposition and I do think you have made it work. Well done! Looking forward to your next experiment! thanks sam ... yes, you have certainly perfected your style ... your ladies of the field are reliably amazing. Candice, thank you so much for you warm and considered reply. Your own work is so impeccably good, you knowledge and skills so advanced, that i find it difficult to imagine you could learn much here. On the contrary, i find myself making notes from your excellent blog, be it on the Zorn palette or on how to photograph one’s art. Your commitment, you intelligent commentary, and your astounding talent inspire every time i visit. Aren’t we lucky to have the web and these blogs! To be able to share ideas and have the stimulus of talented and hard working artists from around the world. hi Teri ... it's risky and exciting trying new things, and a bonus if they meet any kind of success. Thanks for the support. but it makes for an interesting life and a talking point in the blogs to bump against the boundaries a bit. Thanks for finding something of interest in my questing. Such interesting work and comments--I love following. Hello Harry, this portrait especially reminds me a little to the work of Espilimbergo and their eyes large women, beautiful. Thank you for your comment and an honour to follow my work, hug. Hi Harry , U certainly got the porcelane like face efect U were looking for. I like the contrast between the blues ,done with wild strokes typical of U and the pale and delicate face . hi Marlauisa, yes, i agree, i think wild strokes is my natural inclination. This was a one-off experiment to see what i could do on polypropylene. My current piece, a return to self-portraiture and the theme of aging, is also a return to more expressive brush marks. What a beautiful, magical portrait. I love the colors. I love the delicacy of her face and the bold strokes that surrounds her. Beautiful the background and the black of her hair. I keep looking at these strokes, figuring it out. And then the delicate details from her eyes, the mouth, the little necklace. It's awesome Harry! I'm also very intruiged by the polypropylene thing. Wow! This is a striking portrait of her! Love the blues! I'm so excited that you purchased the trilogy of Egon Schiele. You can read a bit of the background to them in my April archive (see right-hand column) 'Harry Kent paintings of Egon Schiele'. Yes, this piece is for sale. If i may, i'll get your phone number from Toni at The Edge and give you a call. I would like to make the sale through Toni, however, since she has so faithfully exhibited and sold my work over a number of years. You are welcome to come by my studio to see the painting before you make up your mind or i can leave it with Toni. We can sort those deatils by phone.